This week was another rainy one, and the farm was pretty quiet. Some of our family volunteers still made the trip to the farm, though! Luckily, our jobs for the day were mostly undercover. We started by looking for eggs to collect, but we couldn’t find any! We thought that perhaps the hens hadn’t laid many because it was cold. After we had checked for eggs, it was time to get to work on the stables. We worked in the larger donkey’s stables, while the other farmyard volunteers worked in the miniatures’ stables next to us. We’ve been very lucky recently, to have received some items from our Amazon Wishlist! The most recent donation were these wonderful shavings forks! They are smaller than the other ones we have on the farm, so they are perfect for children to use. We’ve heard that our adult volunteers have also been using them, so the farm is very grateful for the donation! Although there were only a few of us, we got the job done well. We made sure to congratulate ourselves on our good teamwork. We also noticed we were getting good exercise by mucking out the donkey stables! We had some time left over after we had mucked out Derek’s and Bayleaf’s stable, and replaced their water and hay. 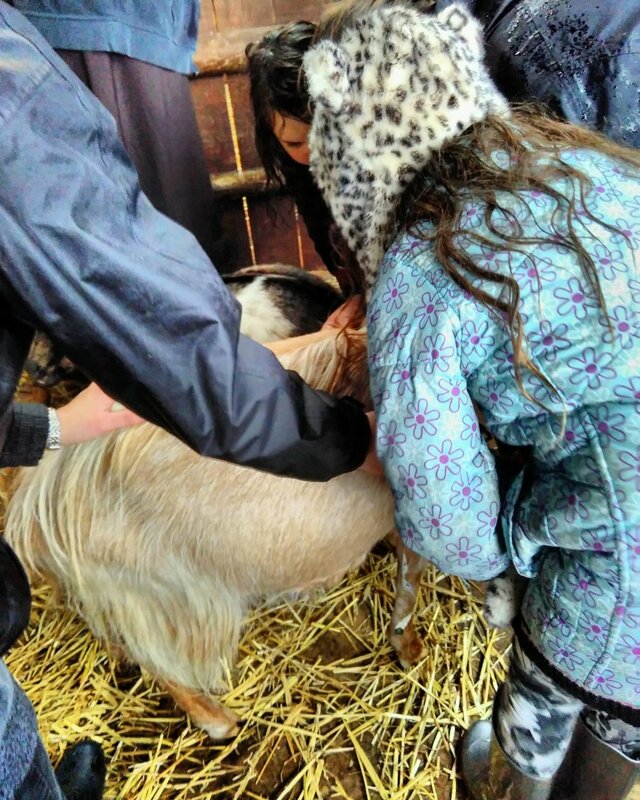 We were lucky to have Jenny, the farmyard manager onsite, and we joined her in weighing the goats. Jenny asked us to think about how we were going to weigh the animals. We thought about how we weigh ourselves, and how vets weigh animals, which is on a set of scales, but the farm doesn’t have scales big enough for goats. We didn’t know how we were going to weigh them, in that case, so Jenny showed us the method. In order to find out the weight of a goat, we had to measure what is known as their ‘heart girth’. This is the section of the body where their heart is. Jenny showed us how to measure it with a measuring tape, and then we were able to try it ourselves! Jenny had a table for us to check, once we had the heart girth measurement, which would tell us the weight of the goat. There were different tables depending on which type of goat we were measuring. The table was very useful. Hamish was so keen on in it, that he kept trying to eat it! 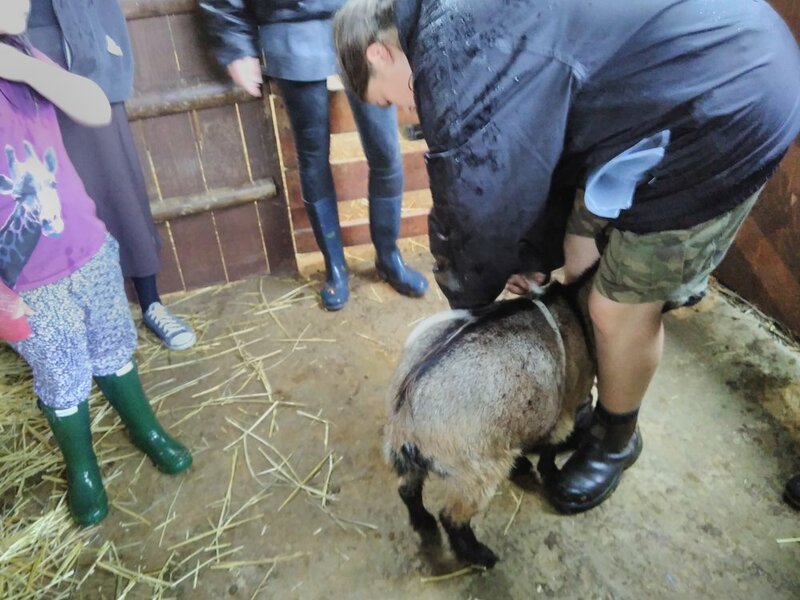 We measured all the goats - Hamish, Harry and Hugo the pygmies, Rocket, Pepper and Sweatpea, the Bagots, and the Golden Guernseys, Bramble, Demeter, Juniper and Hazel. There was a bit of chasing involved, but we managed to get all of the goats to co-operate, and we noted down their current weights. They were all at a healthy weight, which means that the farmyard staff have been feeding the goats the right amount of food, and we don’t need to change how much they are fed. It was great to spend time with the goats today. At Families Go Wild, it’s important that volunteers only do what they feel comfortable doing. Our volunteers are good at letting us know what is comfortable, and when they feel they can step out of their comfort zone. We notice that each time we spend time with the animals, our confidence in handling them and being around them increases.